In 2017 and 2018, the Baker administration’s Department of Energy Resources solicited long-term proposals for Massachusetts offshore wind-power. They came in at much lower rates than ones in 2012 from the failed Cape Wind project, cancelled in 2015. Vineyard Wind, the contractor designated in May, 2018, would provide a significant share of the state’s electricity–around twice as much as Cape Wind. Massachusetts has the largest offshore wind energy potential of any U.S. state, estimated by NREL at more than 1,000 TWh per year. Vineyard Wind of New Bedford, MA, plans to install about 100 turbines rated at 8 MW each–with blade tips reaching about 700 feet above the water–in an area of about 250 square miles commencing about 15 statute miles south of Martha’s Vineyard. Water depths there span about 120 to 160 feet. Environmental disputes over interference with fishing and over routes for the main power cables continue. Vineyard Wind estimates a capacity factor of at least 45 percent, which would yield at least 3.15 TWh per year–equivalent to about 6.5 percent of the electricity used by Massachusetts retail customers in 2015, the latest year in state reports. If operating today, the proposed project would be the world’s largest offshore wind farm. According to the agency, over 20 years Vineyard Wind would charge an average wholesale rate of $0.084 per kWh, adjusted to 2017 dollars. By way of comparison, ISO New England reported that the average wholesale rate for electricity delivered during 2017 to northeastern Massachusetts, including Boston, was $0.034 per kWh. According to 2012 agreements–now cancelled–Cape Wind would have charged $0.194 per kWh in 2017. Analysis: Rather than tell what Massachusetts electricity customers have actually paid for wholesale electricity, the Department of Energy Resources offered a wordy argument about what they might pay during years of the proposed Vineyard Wind contracts. Most so-called “business reporters” parroted agency arguments and did not investigate them. The agency claimed an average rate of $0.079 per kWh for other sources of electricity during the proposed 20 years, but it presented neither data nor methods to support the claim. Using net present value, the agency also estimated a different and lower rate for electricity from Vineyard Wind, but again it provided neither data nor methods to support the estimate. Sources: ISO New England and U.S. Commerce Dept. 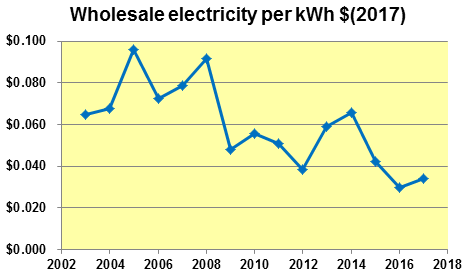 Actual, inflation-adjusted average wholesale electricity rates, reported for the region by ISO New England, declined during 2003 through 2017. They fell from around 8 cents per kWh in the early years of that period to around 4 cents per kWh in the most recent years. The rate history provides no support for a claim by the state Department of Energy Resources that rates over subsequent years will again rise to average about 8 cents per kWh over 20 years. The agency has not supported its claims with data and methods. 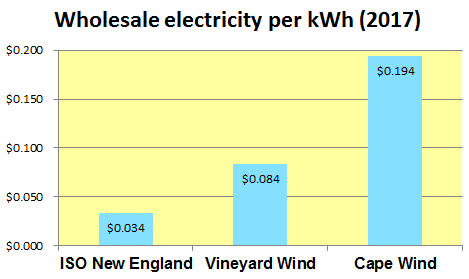 Based on actual and recent data, Vineyard Wind’s output and pricing would raise Massachusetts wholesale electricity rates over 20 years by an average of about $0.0033 per kWh above the average rate for 2017 reported by ISO New England. Although it got lower rates for offshore wind-power from Vineyard Wind than proposed six years earlier by Cape Wind, the Baker administration did not achieve parity with recent wholesale electricity rates. Background: For 2015, the latest year in published state reports, Massachusetts sites generated 2.65 TWh (43 percent) out of 6.23 TWh in total renewable energy supplied to Massachusetts retail customers. Within that total, 2.52 TWh came from wind (Massachusetts 18 percent), and 1.20 TWh came from solar (Massachusetts 94 percent). The rest, 2.51 TWh, mostly came from hydropower, landfill methane, waste burning and efficiencies of combined heat and power. During 2015, Massachusetts retail electricity customers used 48.0 TWh in all. About 13 percent of the state’s retail electricity came from renewable sources. Massachusetts suppliers of retail electricity currently obtain so-called “Renewable Energy Credits” to satisfy six standards under state laws and regulations: Renewable Portfolio Standard Class I (2003), Class II (2009), Solar Carve-Out I (2010) and Solar Carve-Out II (2014), Waste Energy (2010) and Alternative Energy (2010). Federal reports on Massachusetts electricity measure only in-state generation and do not acknowledge some sources credited by the state, such as combined heat and power efficiencies. The Baker and Patrick administrations have tried to develop new sources of renewable energy needed under laws enacted in 1997, 2008, 2012, 2014 and 2016–the middle three during the Patrick administration. The Patrick administration tended to focus on expanding capacity, while the Baker administration has tended to focus on holding down rates. Thus Baker’s agents strain to show that Vineyard Wind will somehow save money. Construction and operations plan, Vol. 1, Vineyard Wind, U.S. Bureau of Ocean Energy Management, March 15, 2018 (draft). Map, see Fig. 1.1-1 on p. 1-2. Capacity factor, see p. 1-7. Blade tip height, see p. 3-4. This entry was posted in Business, Environment, History on September 28, 2018 by Craig Bolon.